Now you can stay environmentally conscious this year with one simple template to help you. The free Environmental Conservation Checklist is the perfect tool to make sure that you have everything you need to help the environment and help others in your community do the same. 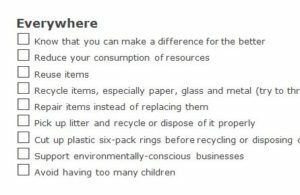 You will receive a simple checklist that displays some tasks that you can perform to make sure you’re doing all you can to save our environment. If you’re ready to start making a different, not only in your own home but in the community as a whole, you can download the free template by following the set list of instructions below. Start by scrolling to the bottom of this sheet and clicking the link at the bottom of this page. This template was meant to be a one-time use sheet that requires you to go through the items listed and check them off as you complete each one. The free template shows you different categories for the items as well. For example, under the “Community” section, the first step is to get to know your neighbors so you can pass on helpful environmental information. When you have gone through the list, you can also add tasks to the sheet as well. You may find helpful information online, like using a bucket of water to wash the car instead of the hose. To add a new item to one of these categories, just write that item on the next available line. In the same sense, you can also change, add, or delete items on the list in the same way. As you make your way down the list, completing tasks, you will simply enter a checkmark to indicate the task has been completed. You can even print the template to pass on the information to your neighbors or friends.